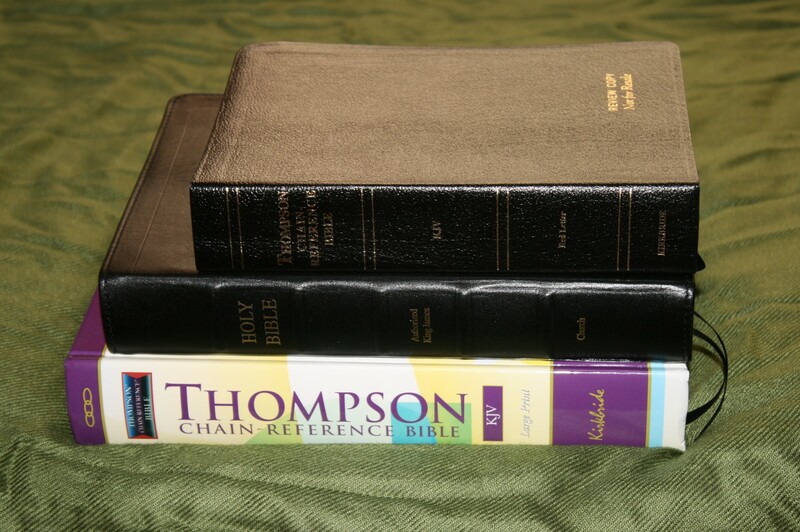 The KJV Thompson Chain Reference is one of the oldest study Bibles available and comes in three different sizes (handy, regular, and large print). Although all three have the same tools each one has an advantage over the others. As you could guess, the advantage of the handy size is it’s easy of handling and carry. Smaller size of course means smaller fonts. Does that make the handy size Thompson difficult to use? I was surprised by the answer. 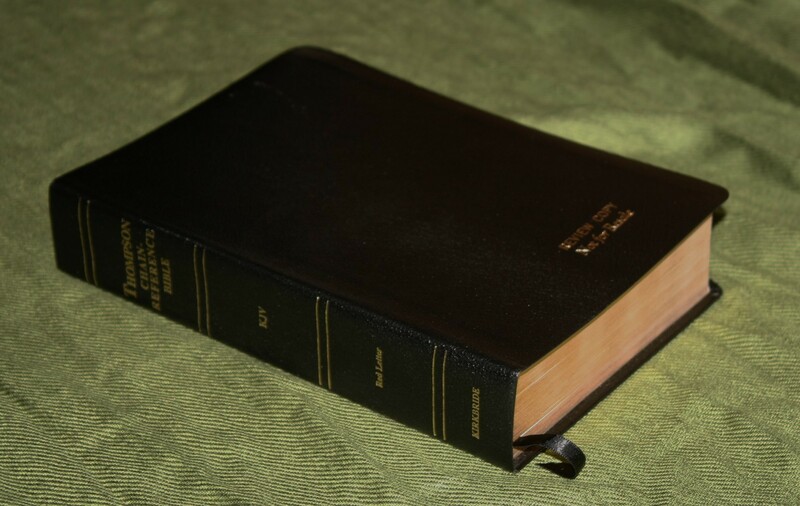 This edition is black bonded leather with a vinyl paste-down liner. It doesn’t droop at all but also doesn’t feel overly stiff either. It’s smyth sewn. 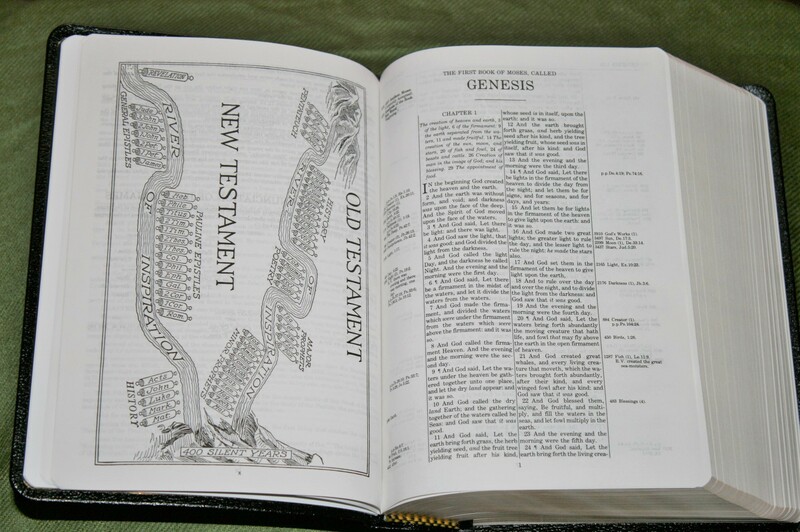 Unlike most bonded leather the Thompson has no problem lying open in Genesis. The stamped grain looks nice. I’ve used it for several months and its help up well. I suspect it will last a few years of normal use. If I can wear it out then I’ll look into getting it rebound. 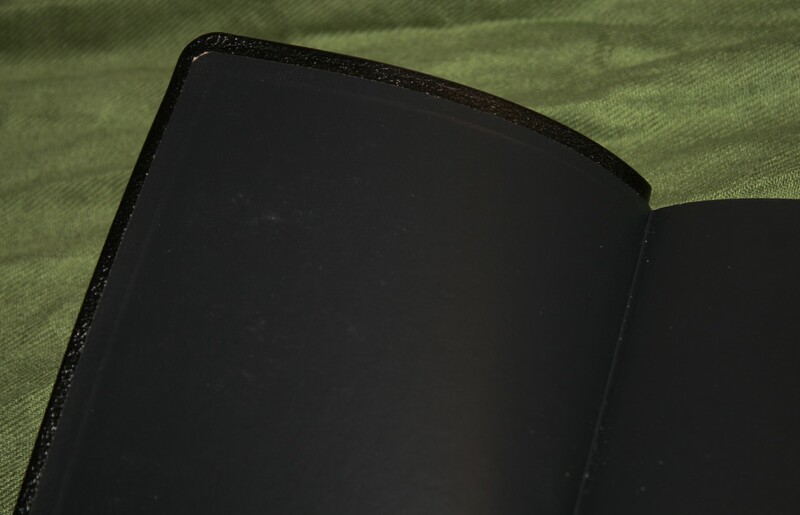 For my review copy Kirkbride provided 2 lines of gold stamping on the cover to show the quality of their engraving. The upper line is block and is in upper case only. The lower line is script and can be both upper and lower case. The printing looks sharp and consistent. If you like having something stamped into your cover then I highly recommend Kirkbride’s work. The size is 6in. x 8.25in. x 1.5in. This is a great size for carry and handling. I found it easy to hold in one hand for reading. It includes one ribbon. 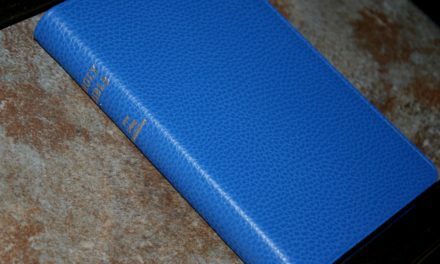 One thing different about the Thompson than other Bibles that I’ve used is the spine of the cover curves inward when opened. This lets the pages lay flat but it looks odd. The paper is more opaque than I expected and it has a white tone. 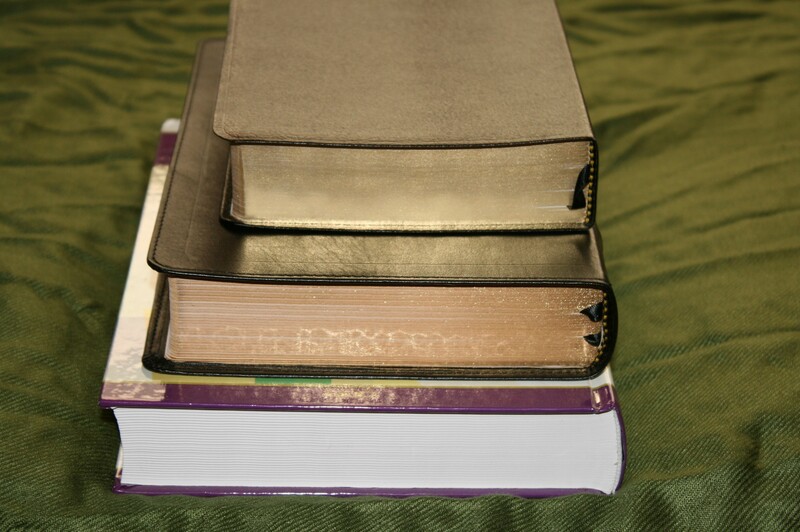 I’m not sure of the gsm but the pages feel thicker than most study Bibles to my fingers. I’m more impressed with the paper of the handy size edition than the regular edition. The paper is more opaque and I can turn the pages easily. 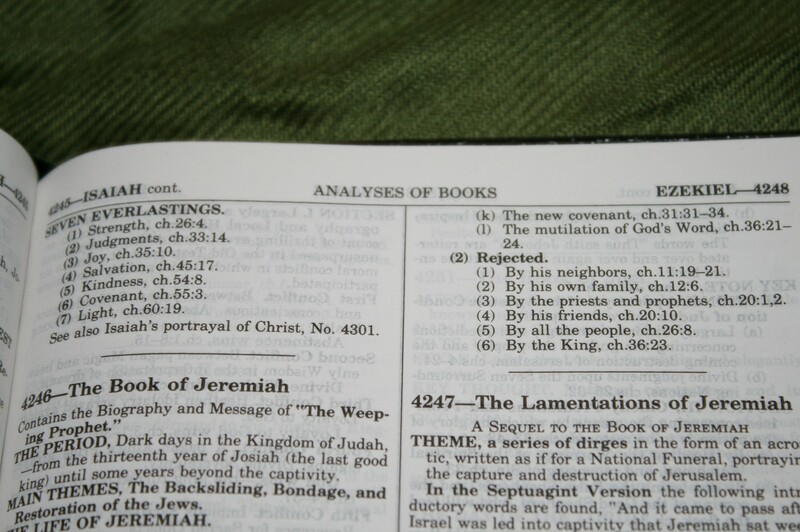 I expected this Bible to be difficult to read because of the paper in the regular edition, but I was surprised in a good way. I like this paper and it helps make the small type easier to read. 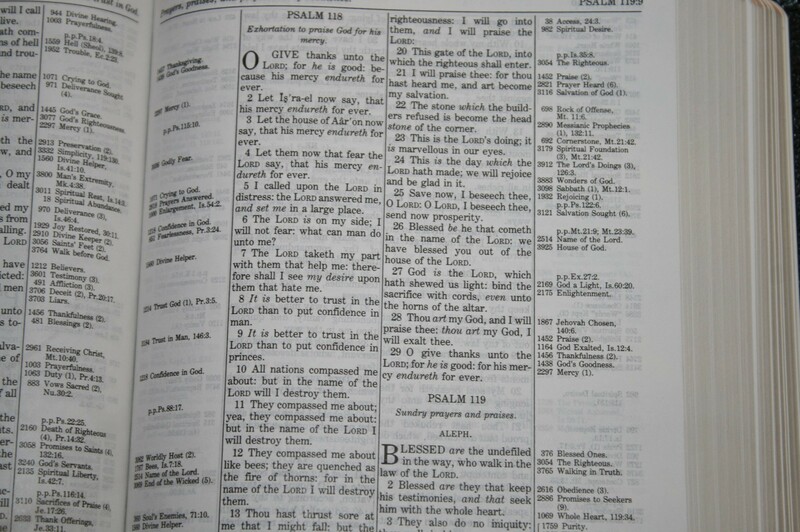 The page is divided into four columns. 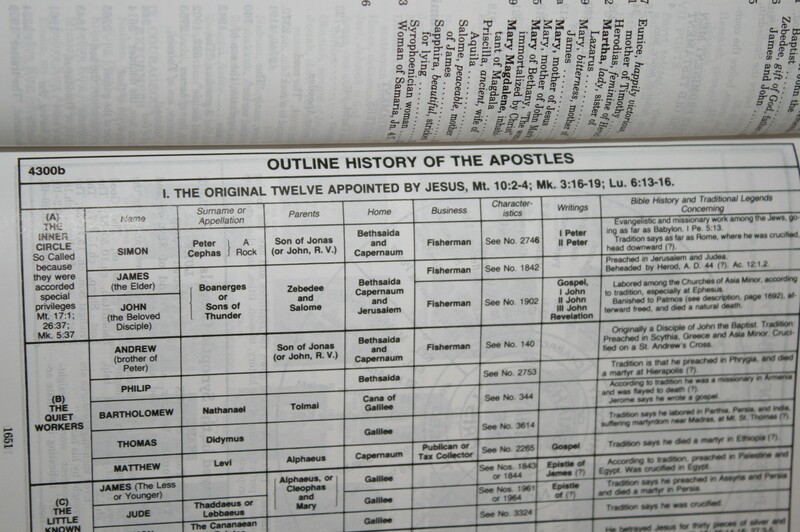 The two outer columns are the chain references and footnotes, and the two inner columns are the text. 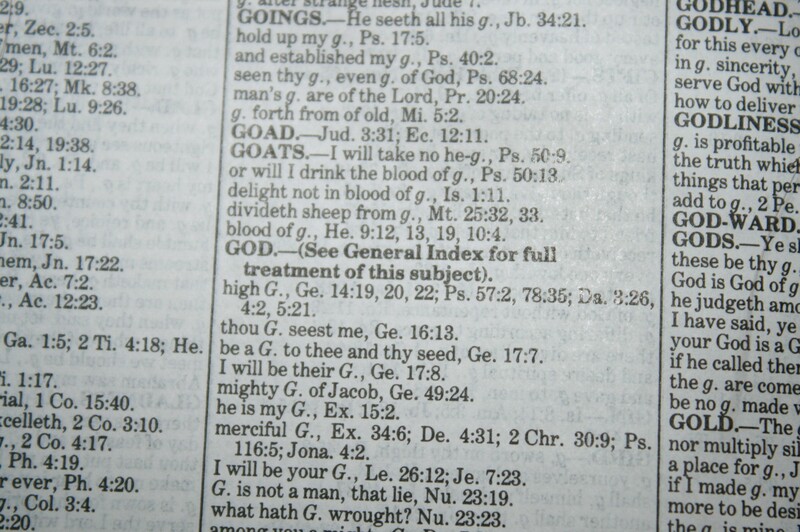 The text is presented with no distracting reference or footnote keys within the text. 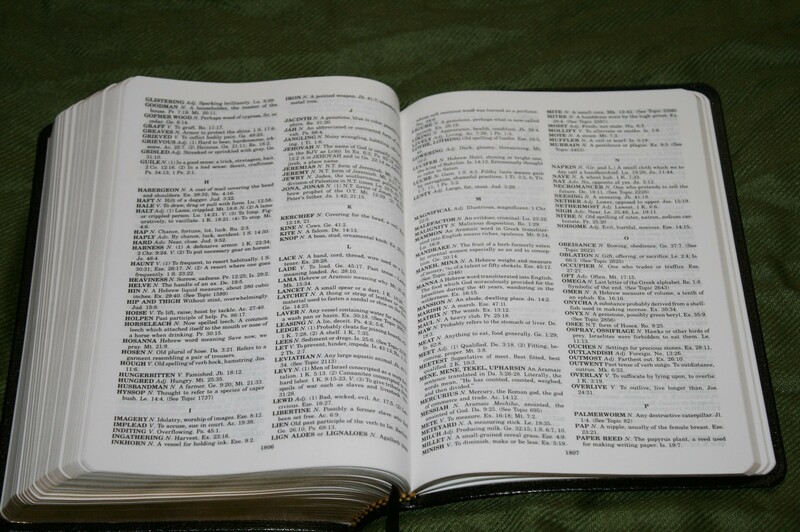 It does have self-pronouncing and italics for supplied words. The font is 6 point and has a generous leading. The leading greatly helps improve the readability. The black and red letter are easy to read. The black is medium while the red letter is about medium/light shade that’s bold enough to remain readable. Both are fairly consistent throughout with no major issues. 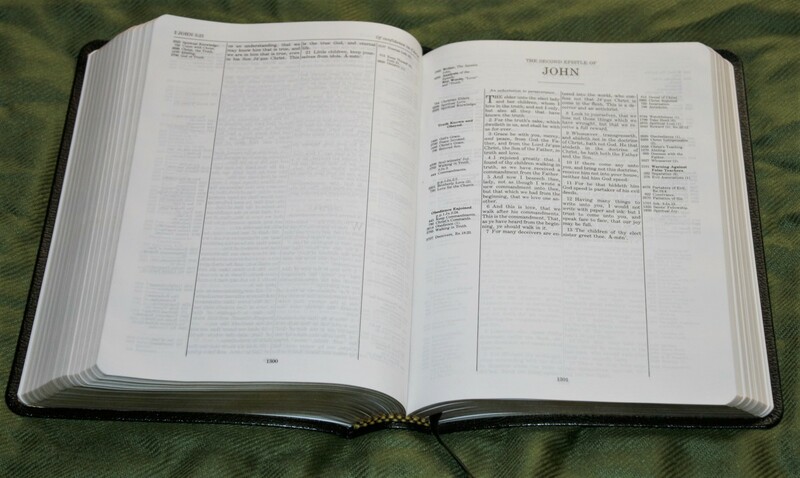 I can read this small text much easier than other Bibles with larger print. I was actually surprised at how easy it was for me to read. 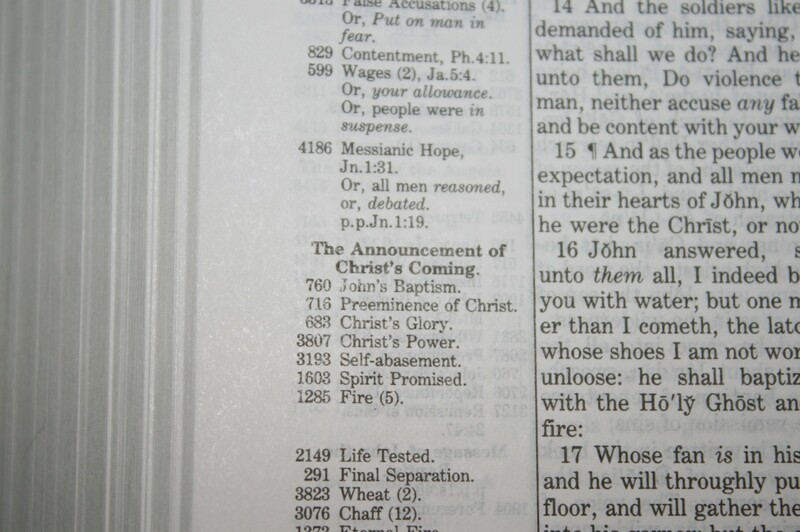 In fact I can read this one easier than the 8-point in the regular edition (due to the opacity of the paper). The columns are 1 3/8” wide with 30-32 characters across. The words are spaced nicely and it never feels cramped. 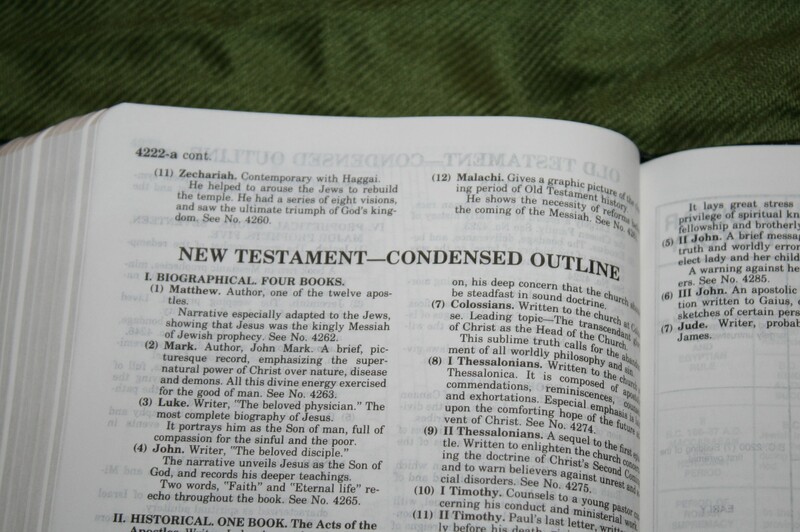 The New Testament has section headings in the margins that are in bold. 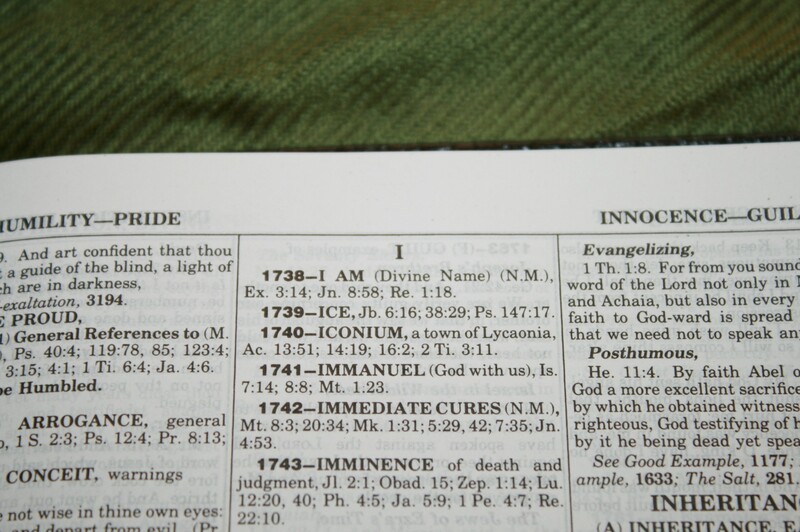 Some include references to parallel passages. 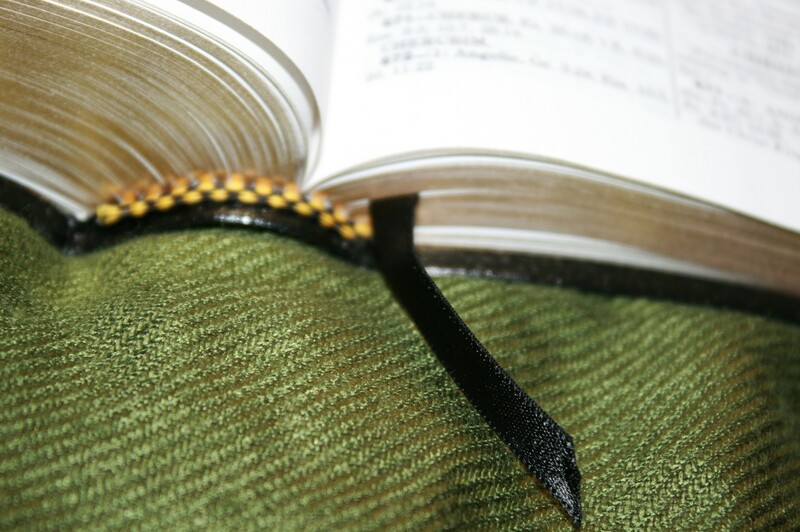 The outer corner of the header includes the book name, chapter, and verse of the first or last verse on the page. The inner portion of the header shows a page summary. The chapters include chapter summaries. 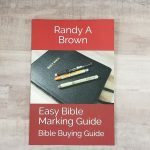 All of these combined, along with the topics in the margins, are a great help in finding something on the page quickly. Some of the margins have space for short notes or symbols. A lot of the time what I would want to write in the margin is already there. Books start on a new page, giving a little room for notes. The layout helps make the tools useful. 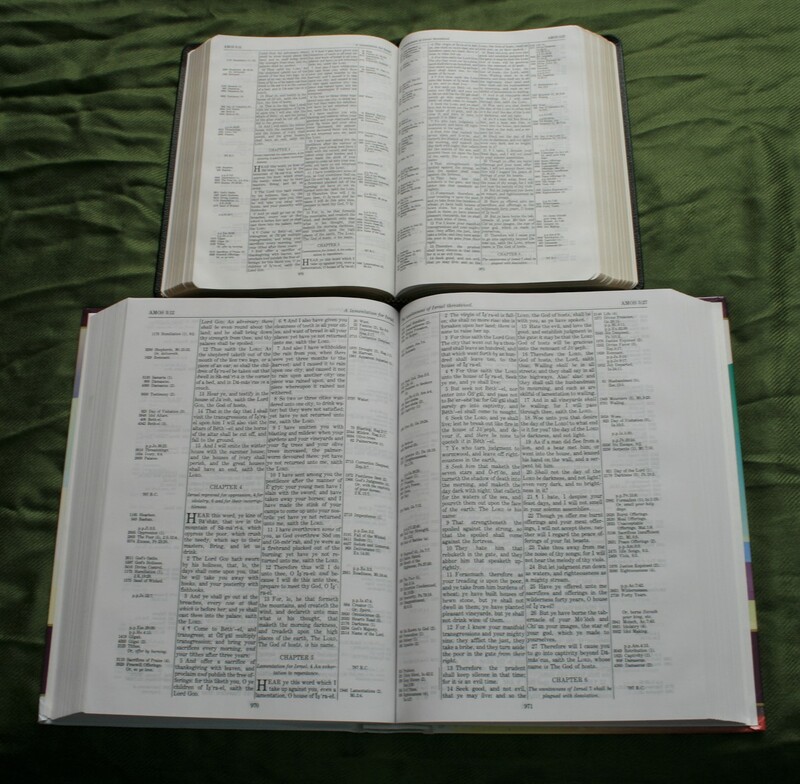 References and footnotes are next to the verse where you need them but they can also be ignored if you just want to read. Although the layout looks busy the tools are non-distracting. There are 100,000 chain references within the margins. 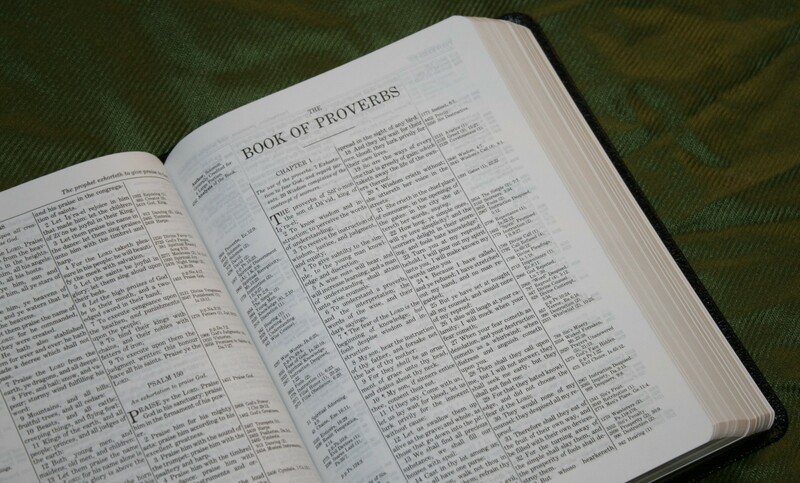 They are placed in the columns next to the verses they correspond to. 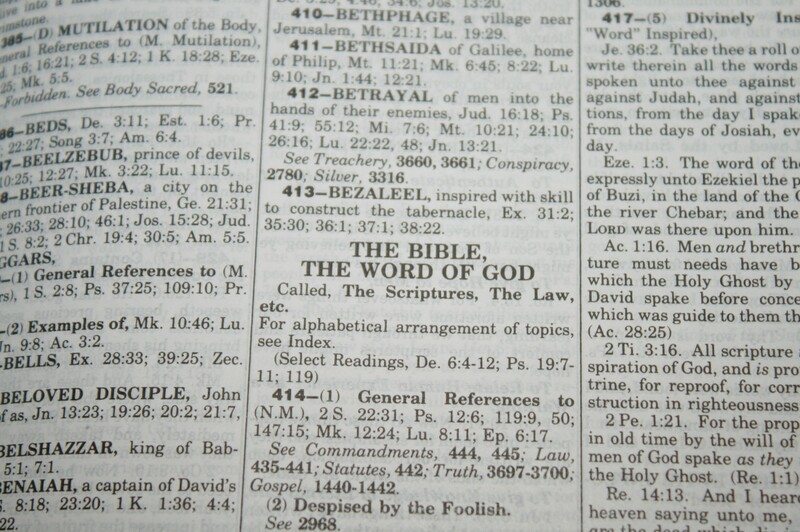 The references give the topic name, topic number, and the next verse in the chain. Some only include the topic number. 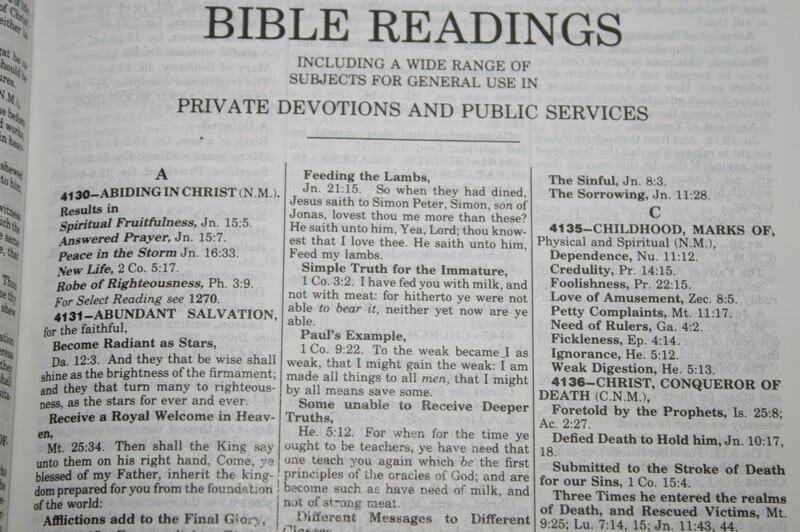 For these you can see the verses in the back. This helps save space in the margins. 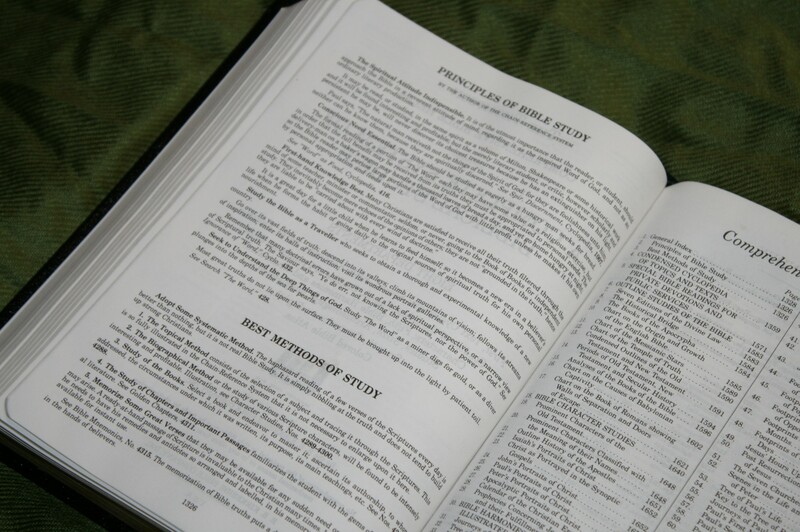 References also include parallel passages and where something is quoted from. The translators’ footnotes are included. I’m glad to see they’re still here as most Bibles are doing away with them. 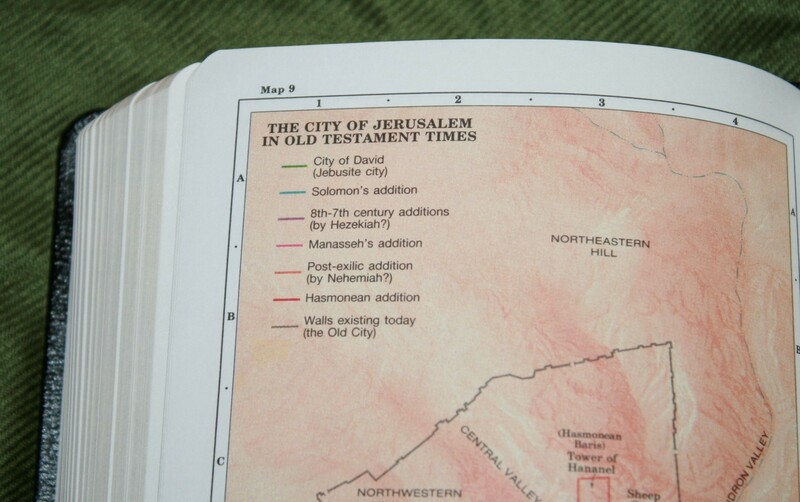 Footnotes also include alternate renderings from the RV and section headings with parallel passages (in the NT). 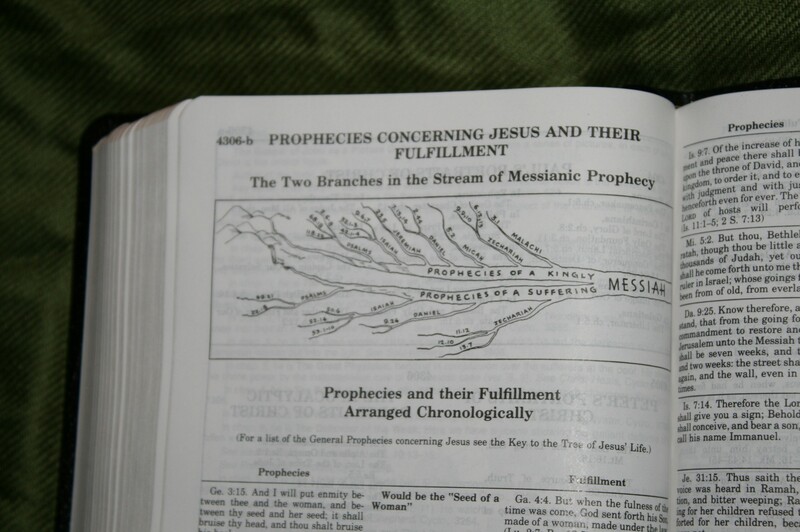 Some chapters include possible dates the events took place. 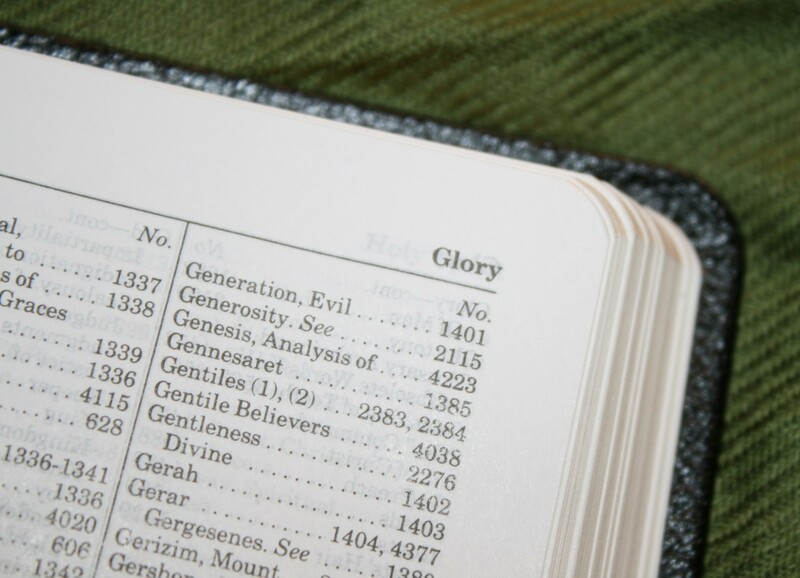 General Index – this is a comprehensive index to all of the topics found in the Thompson. It gives you a number, which you’ll take to the next section to find the references. 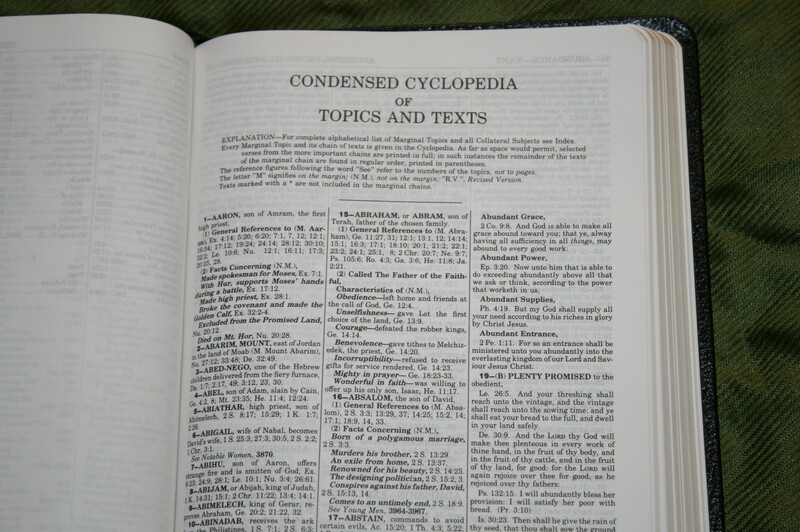 Condensed Cyclopedia of Topics and Texts – this is the complete topical section of the Thompson. It contains chains that are printed out, chains with just references, chains not found in the margins, and suggestions for related topics. 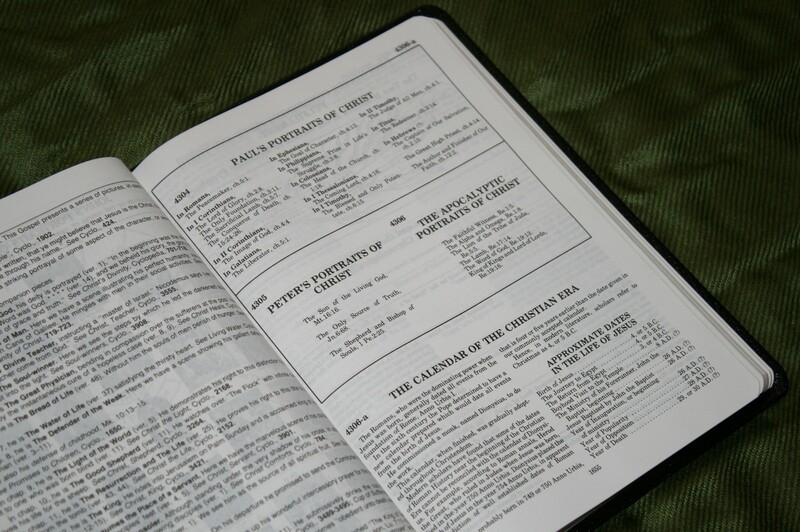 This is one of the most useful tools for topical study and is helpful for personal devotions, study, and sermon prep. 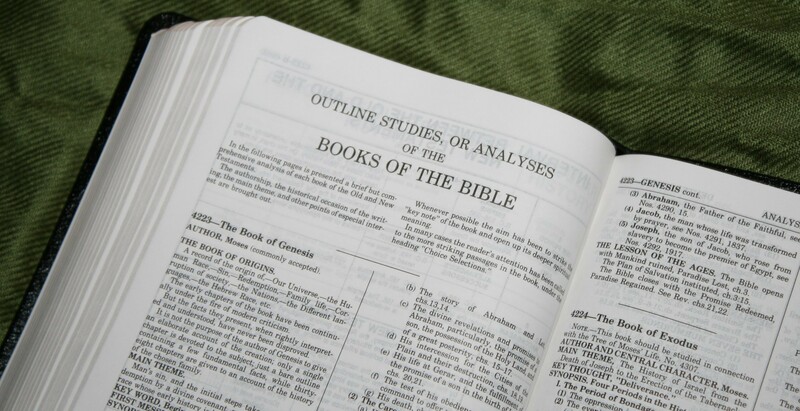 Outline Studies of the Bible – this section starts with an overview of the various Bible translations in English up to 1990. 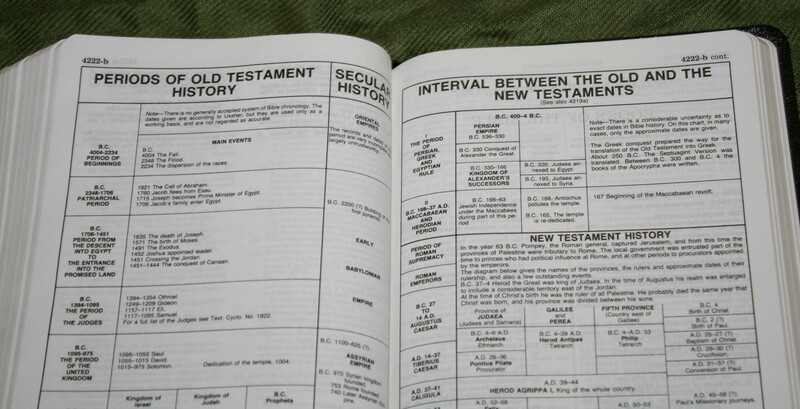 It has an overview outline of both testaments and an outline of each book of the Bible. The outlines contain analysis and links to topics. 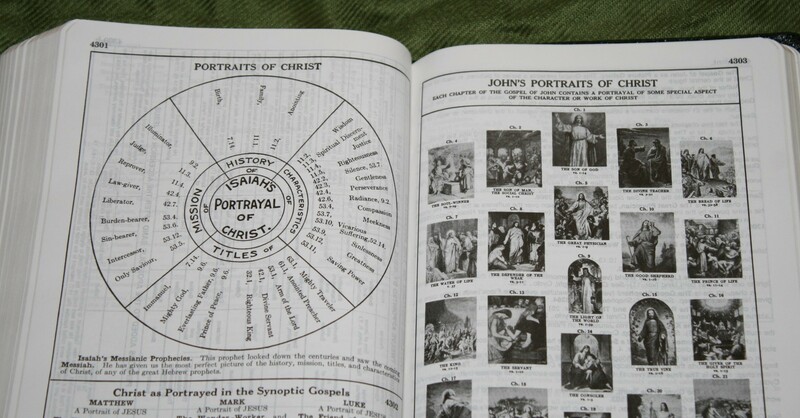 Character Studies – this covers biographical sketches of the most prominent characters in the Bible. It includes historical information and topical links. 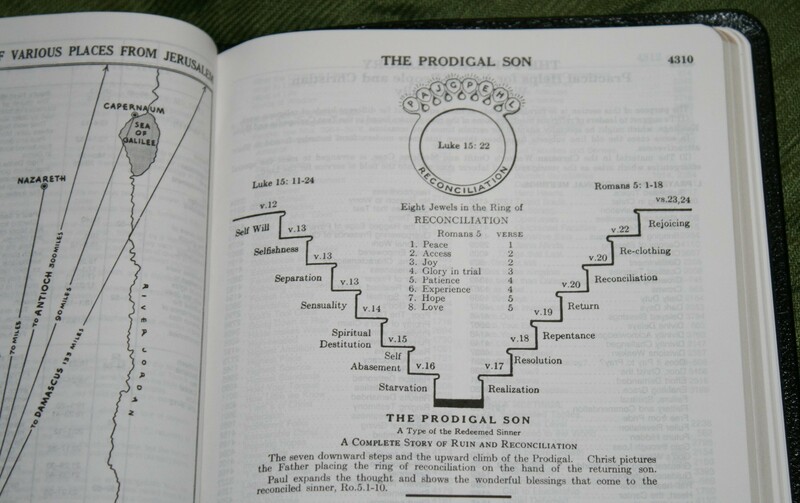 Prophecies Concerning Jesus and Their Fulfillment – this is a table that shows the OT prophecy and the NT fulfillment. 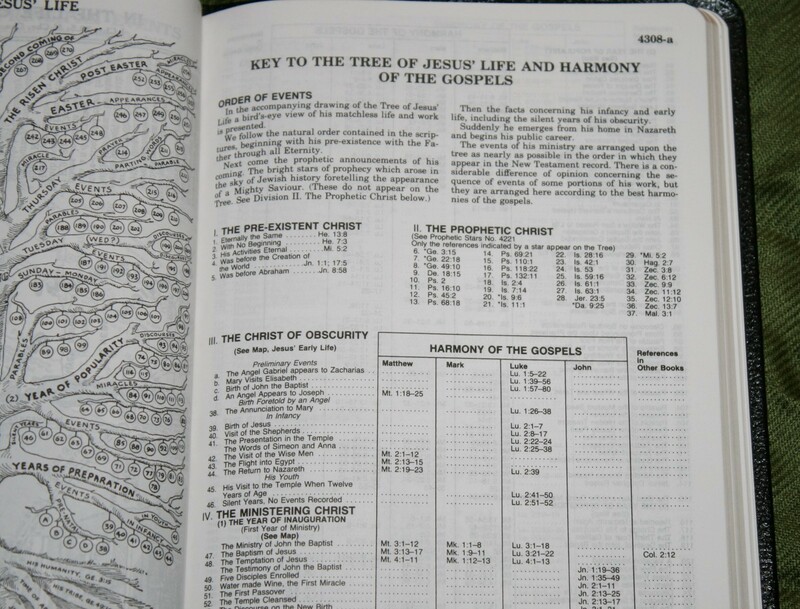 Bible Harmonies and Illustrated Studies – this section includes life trees, pictorial maps, charts, outlines, graphs, and more. 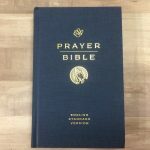 Topical Treasury – this is a topical index of studies for Christian workers. Topics include meetings, men’s and women’s studies, etc. 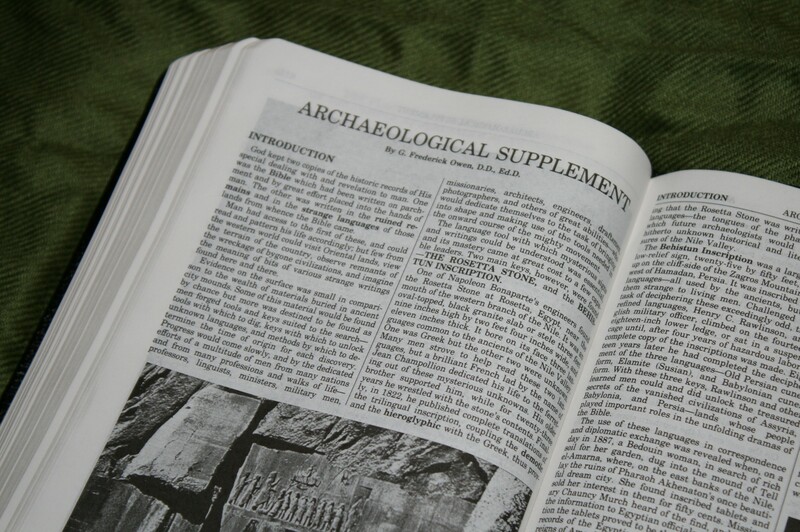 Archaeological Supplement – this section covers the places in the Bible and the archaeological information about them. 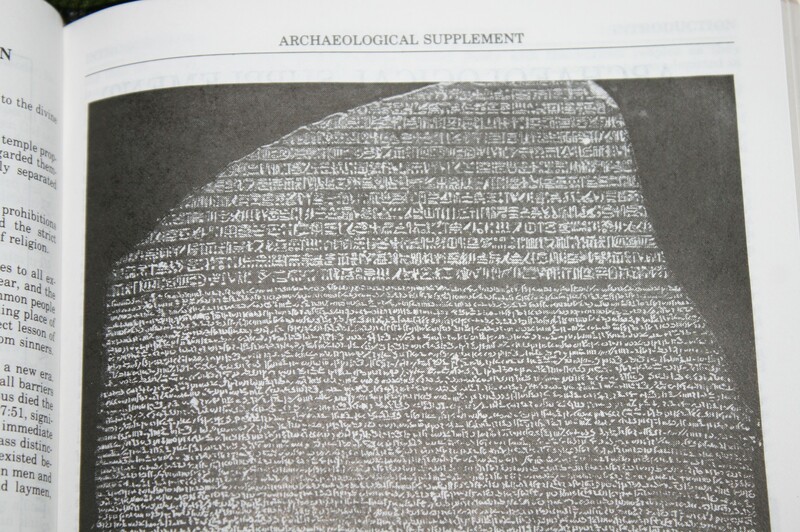 It includes lots of black and white photos of places and artifacts. 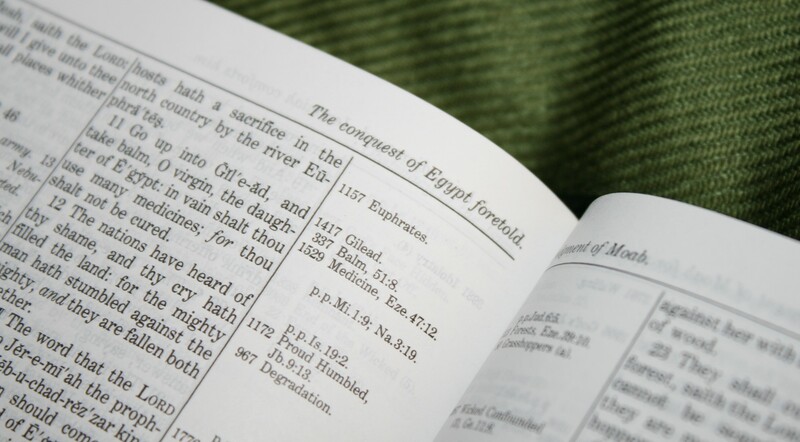 Glossary – this section includes old English, Hebrew, Aramaic, and Greek words and gives their modern meanings. 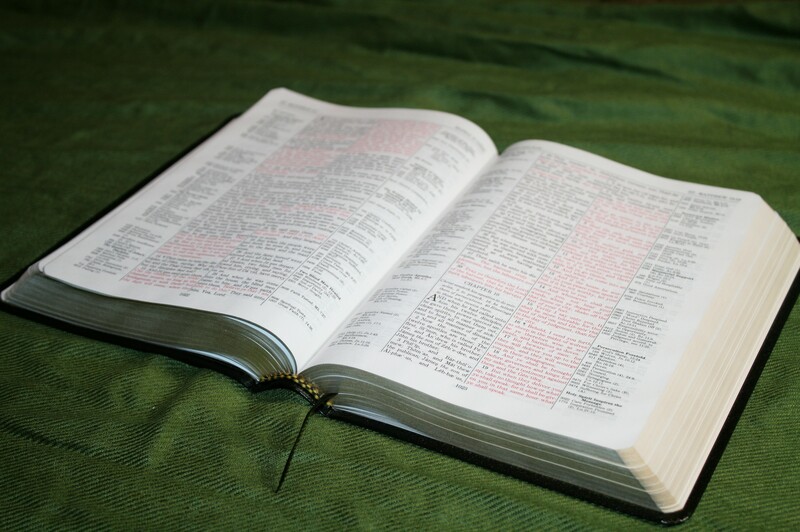 The definitions include the part of speech and references to the verses where they’re used. 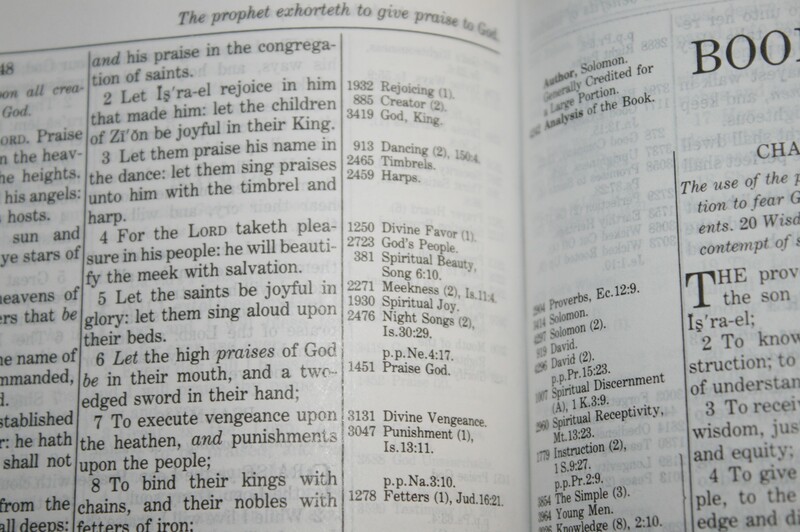 All of the content is keyed to the topical system, so some references in the margins point to these sections. 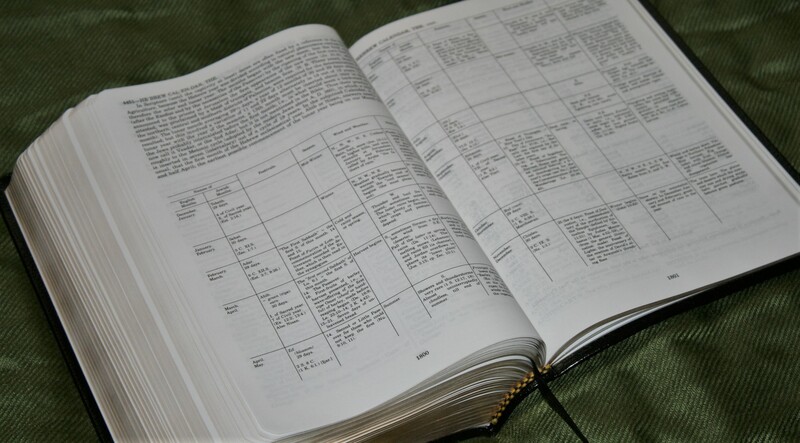 The Comprehensive Bible Helps is an excellent tool for personal study, devotions, and sermon prep. 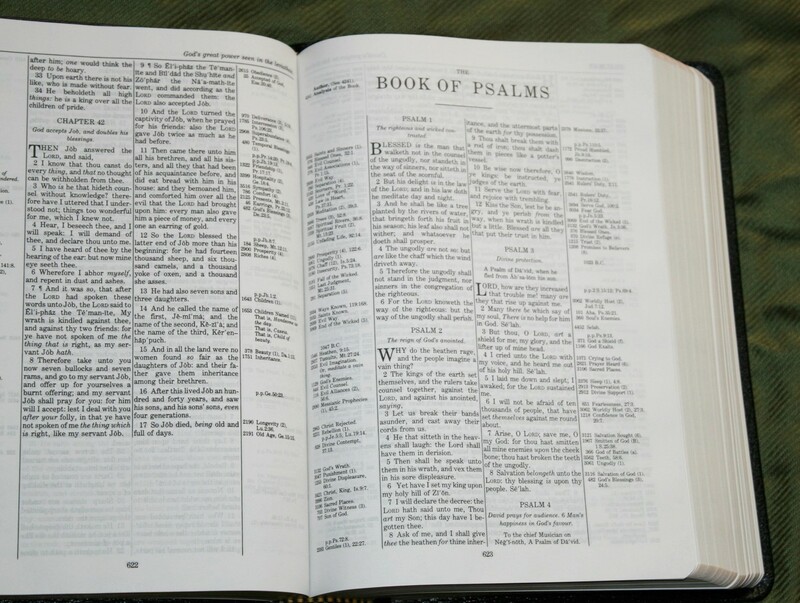 There have been many hundreds of thousands of sermons built from these pages and for good reason. 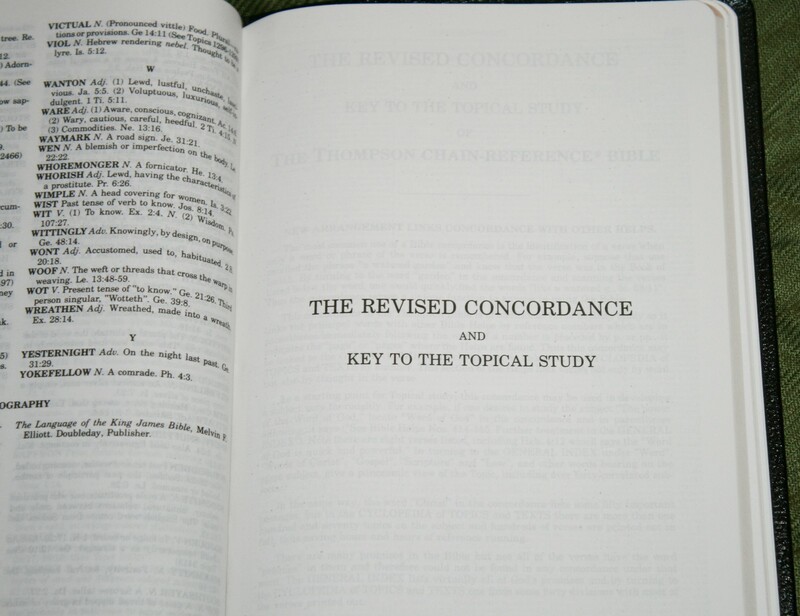 The Thompson concordance is one of the better concordances in my opinion. It’s 97 pages with 3 columns per page. 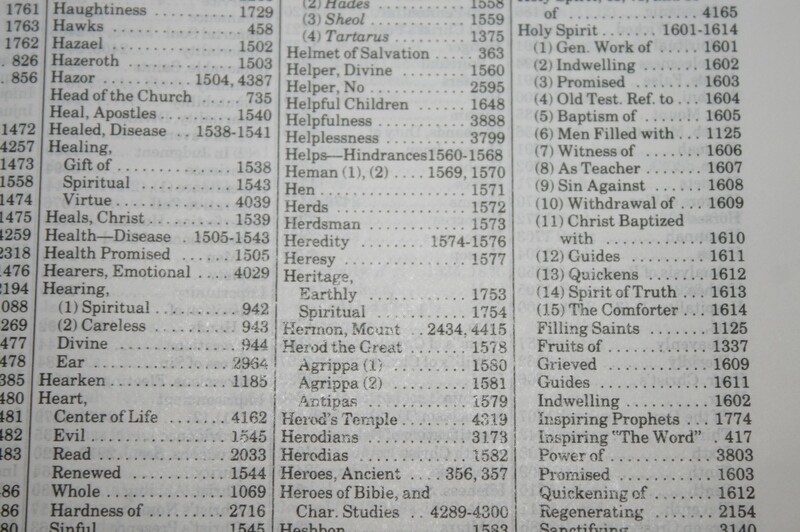 Some entries give topic numbers so you can find them in the biblical helps section. Here are some sample entries with their number of references. As you can see there are a lot of entries and links to even more info. 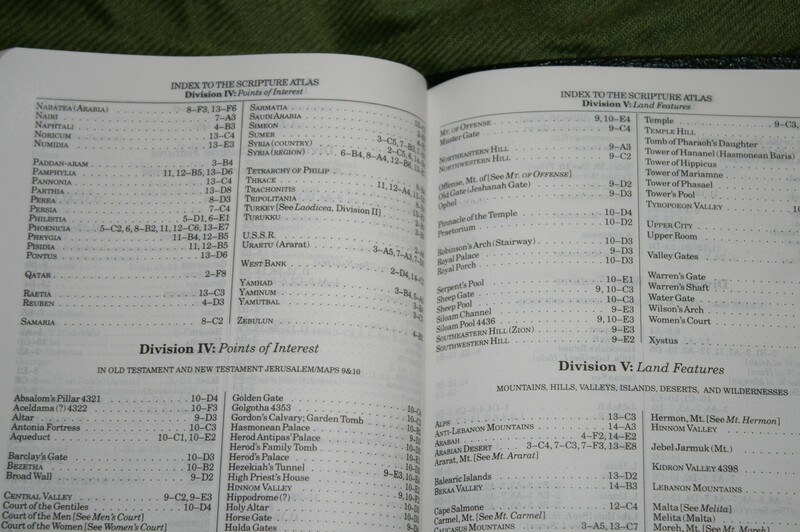 This is a great tool for study and sermon prep. 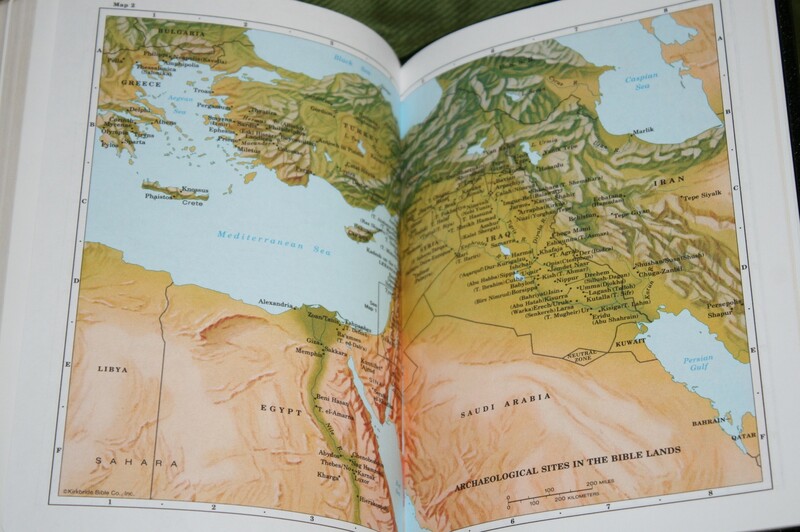 There are 14 full-color maps printed on thick non-glossy paper. 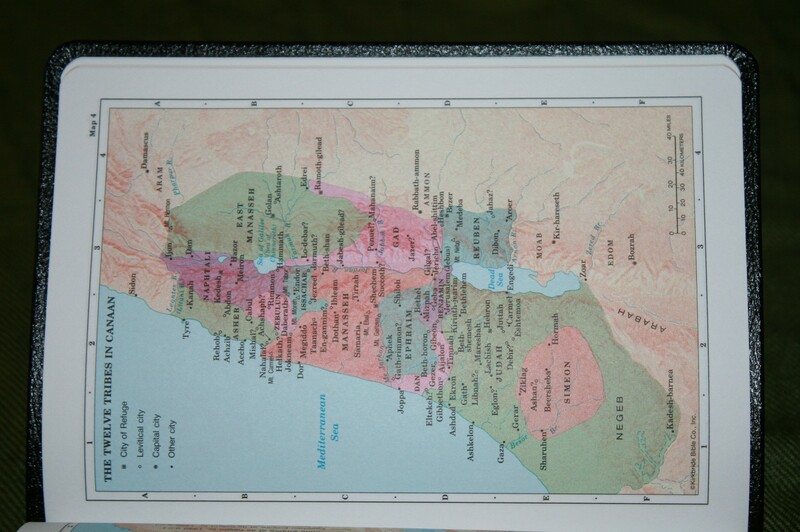 They include borders, distance, rivers, seas, topography, and cities. 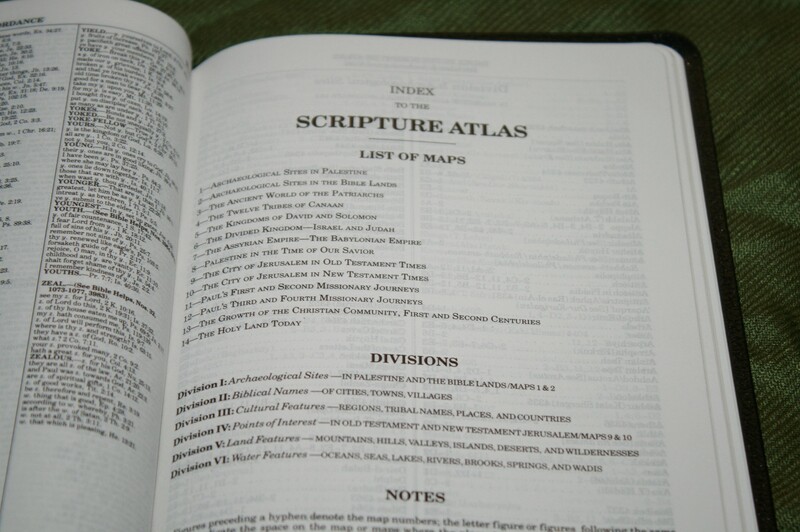 The index is keyed to the maps using a grid system. The hand size was easy to carry and use. I was the most surprised by how easy the small font is to read. 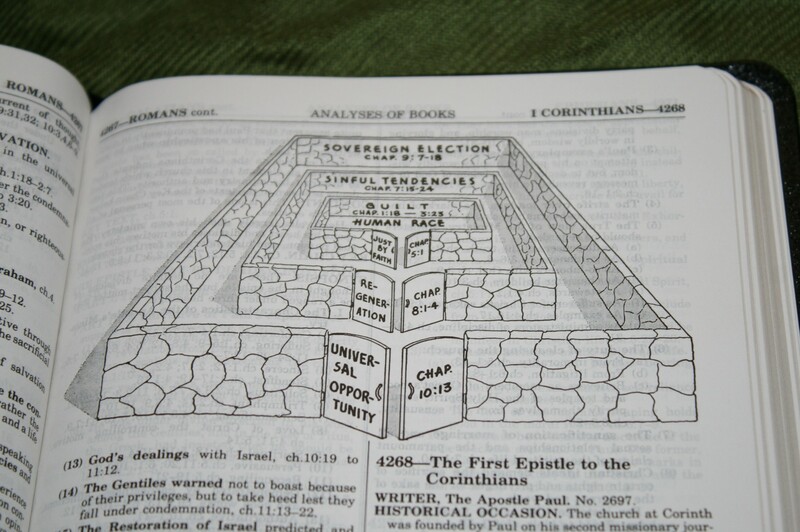 I even preached and taught from it several times. 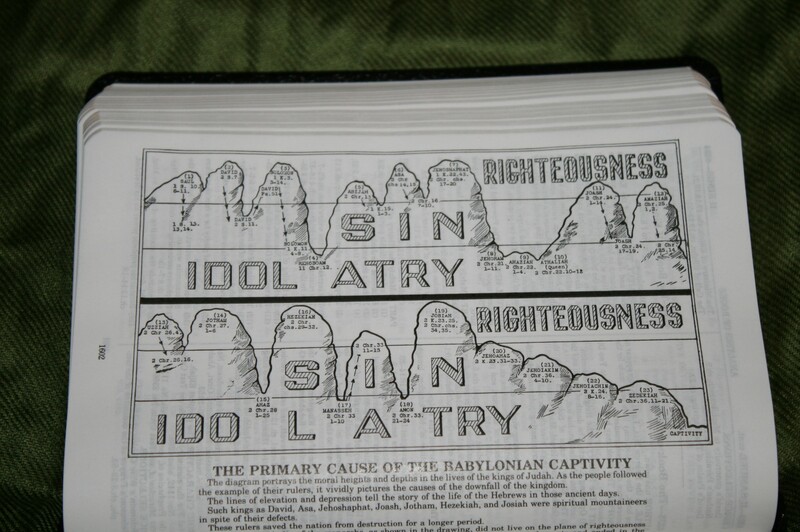 I typically prefer larger fonts for preaching, but this one wasn’t a problem. I only had a problem reading the small font from behind the pulpit once and that was after staring at a computer screen all day and my eyes were tired. 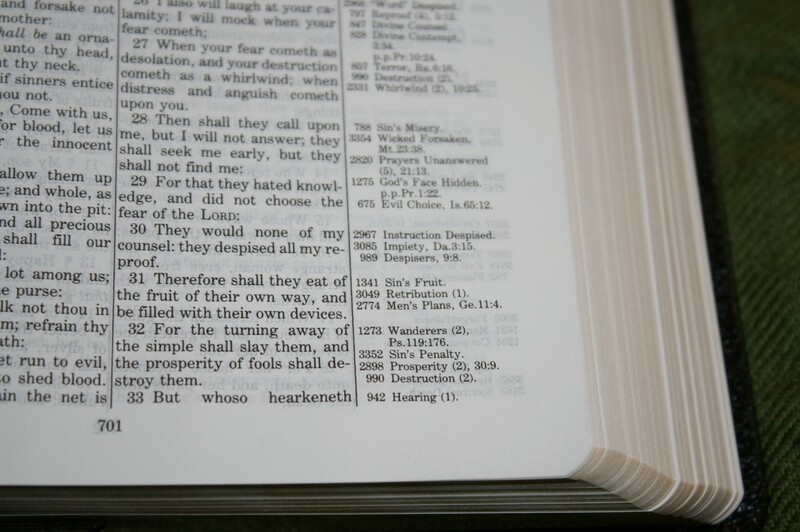 I found that I grabbed this Bible more than most study Bibles because of the size and readability. 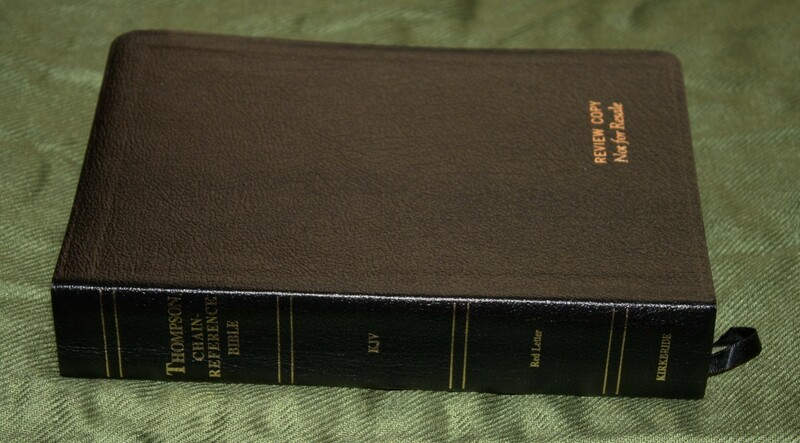 If I wanted to carry a study Bible it would be this one. I’d like to see it available in all popular translations. If I could change one thing I’d like to see the last reference in the chain give the verse for the first reference in the chain. This would complete the circle and allow you to see the full chain no matter where you start. As it is you have to go to the back to see what the first reference is. It’s not difficult to do, so this is only a minor complaint but it would be helpful. Here’s a look at how the handy size edition compares to the regular and large print editions. 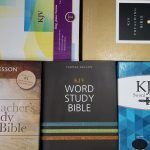 The Thompson Chain Reference study Bible is a Bible with my kind of study material – useful tools to help you do your own study. The Thompson layout translates well to the small page. The style of the font and the spacing between the lines remain highly readable. 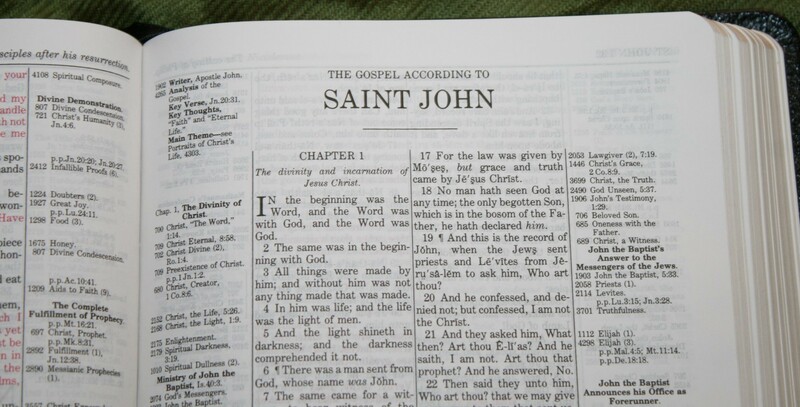 In my opinion the font is more readable than most Bibles with a 6-point font and many Bibles with an 8-point font. 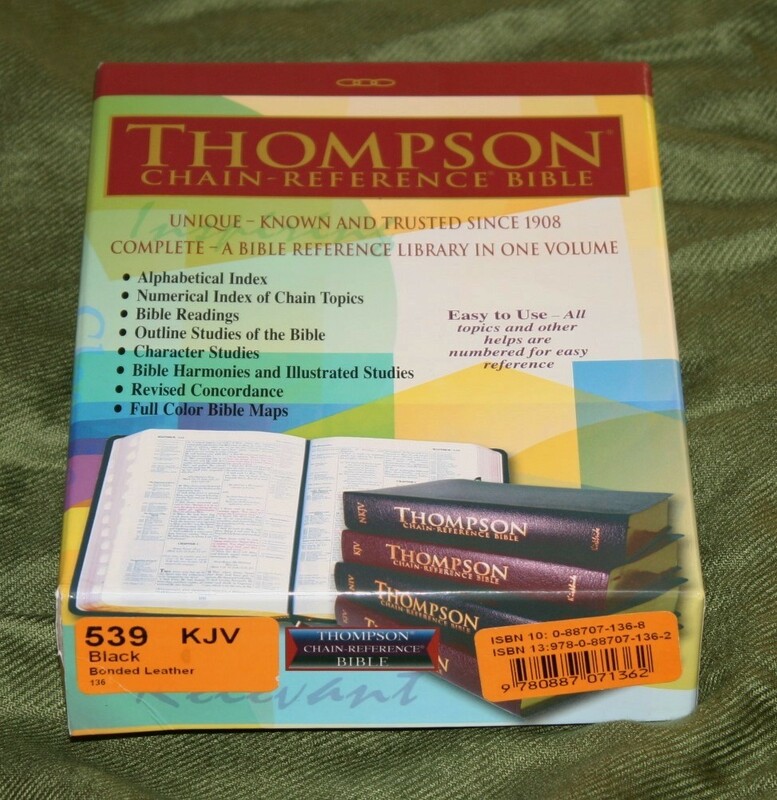 I bought a large print Thompson Chain Reference thinking that would be the one I grabbed every time I wanted to use the chain reference and topical index, but to my surprise it’s the handy size edition that I grab. 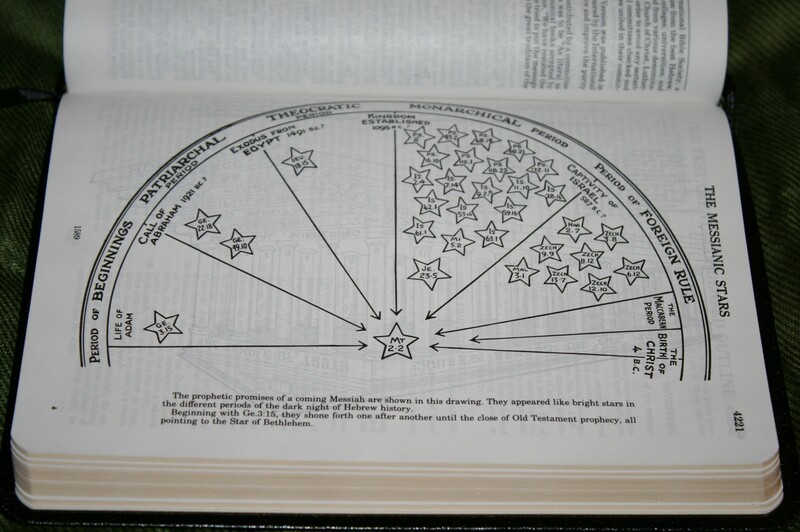 I recommend the Thompson Chain Reference to anyone for devotions, personal study, and sermon prep. If you don’t have issues with small print then the handy size is the one I recommend the most. 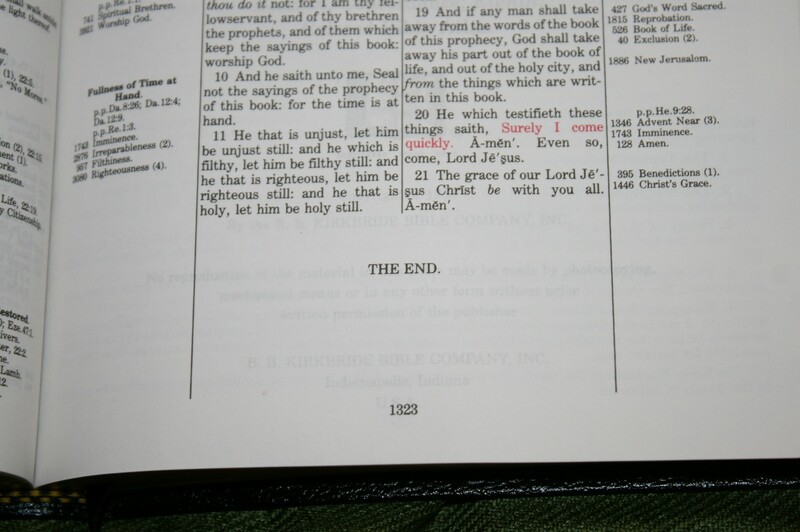 Kirkbride provided this Bible free for review. 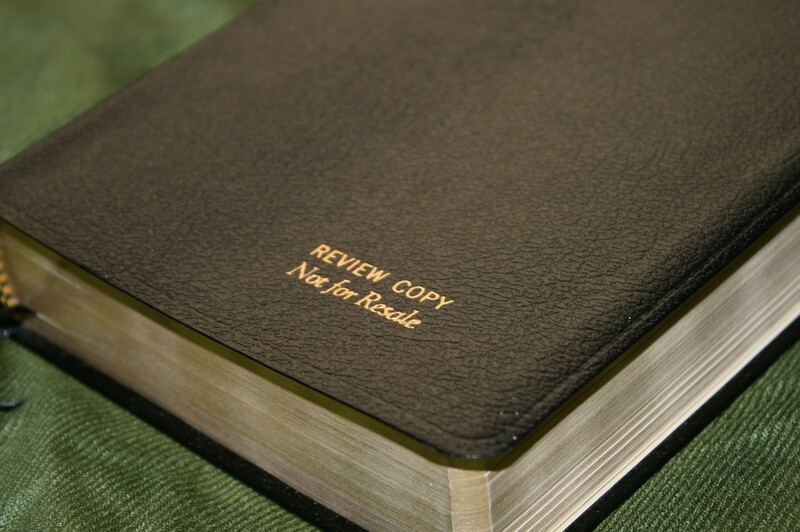 I was not required to give a positive review – only an honest review. My opinions are my own. as always your reviews are insightful, informative, and incredibly enjoyable. 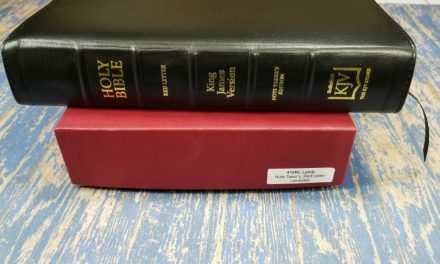 I have done lots of reading and researching, trying to find “the ultimate study Bible” in a handy format and it looks like my search could finally have come to an end. 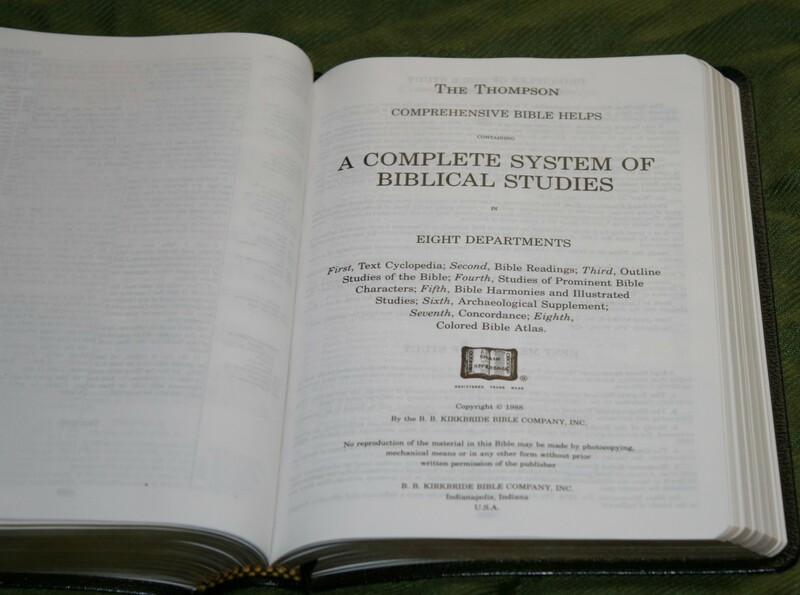 This Thompson seems to combine a perfect size for carrying with high readability and lots of useful tools to help me with the Bible study. 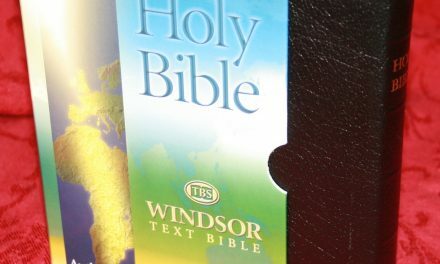 My other two favourites would have been the Cambridge Concord and the TBS Westminster Reference Bible. 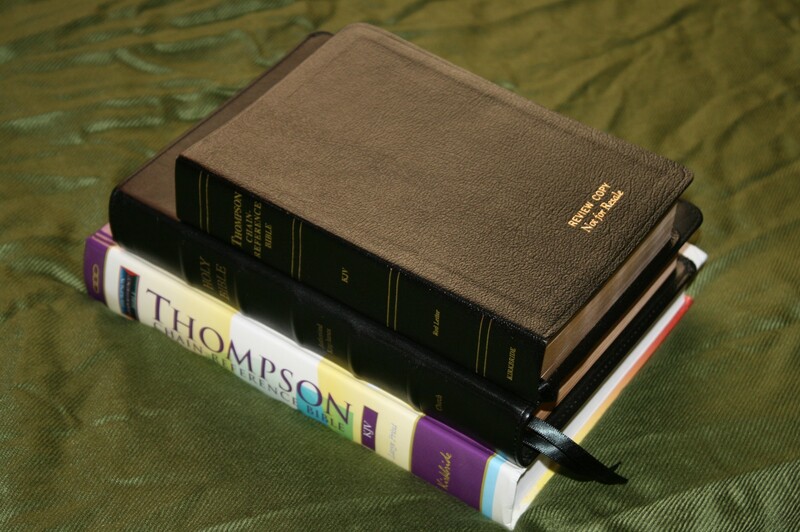 How do you believe they compare to this Thompson and which of the three would be the best choice for an “all-in-one”, easy-to-carry study Bible with lots of helpful tools? 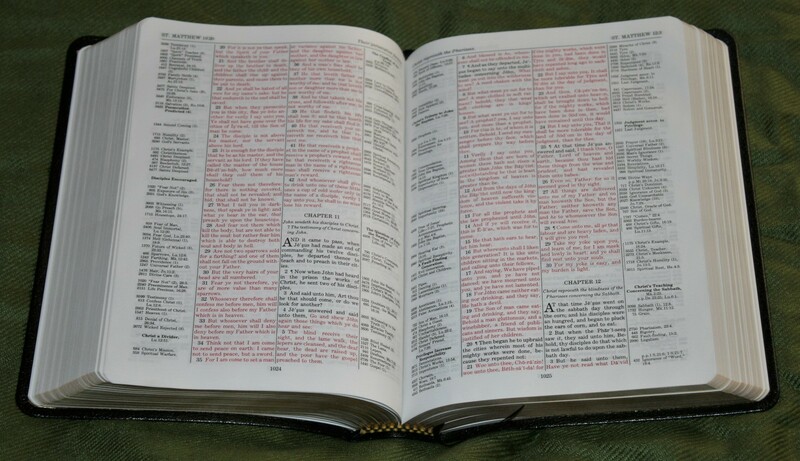 PS: I’m usually not a “note-taker”, but besides from studying and following the cross-references I would also like my new Bible to serve as my daily reading Bible. So if e.g. 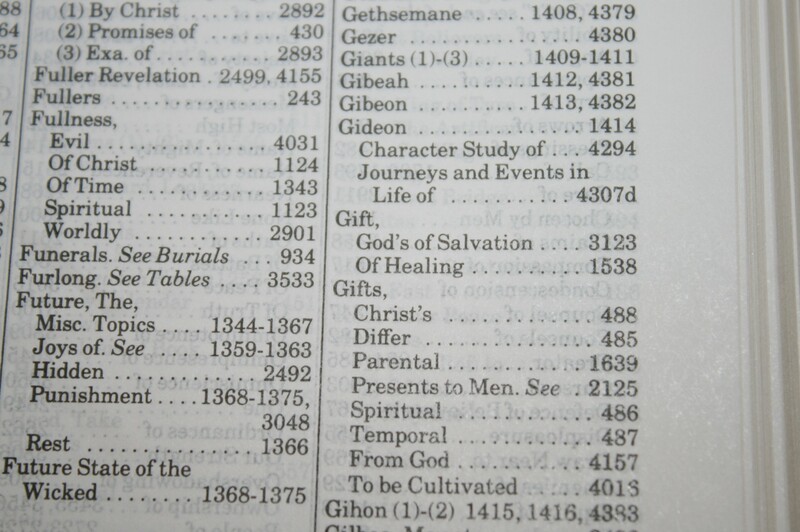 I picked this Thompson, what would I miss that the other two Bibles would offer and vice-versa? Your comments and help would be greatly appreciated, Randy. Thanks for the kind words. 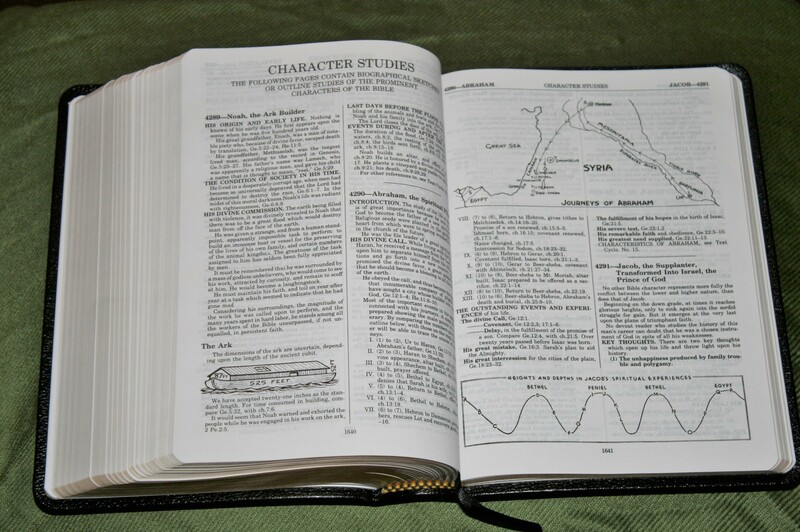 I like the way you think about a study Bible – great tools to do your own study. All three of those are great choices and each has advantages. – The Thompson has the most. 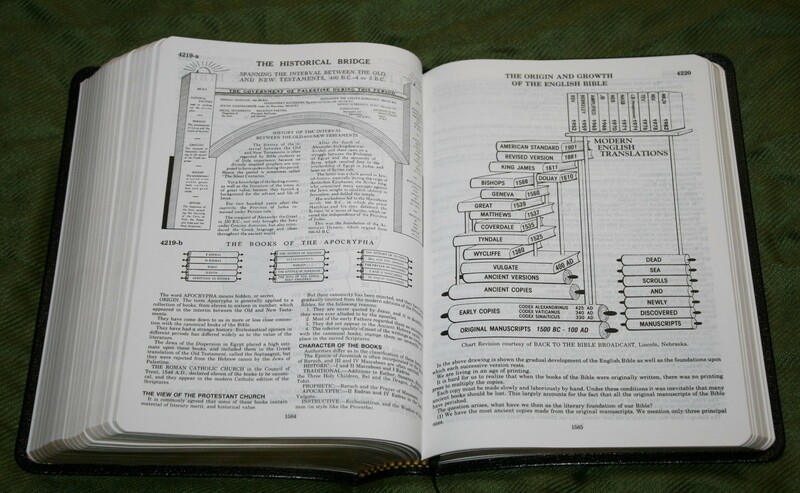 It has the most archaeological information, a glossary, topical lists, and tons of outlines and charts, and a good concordance and maps. It has 100,000 topical chain references. The topics printed in the margins are similar to what I would write if I were taking notes. There are no distractions within the text itself. 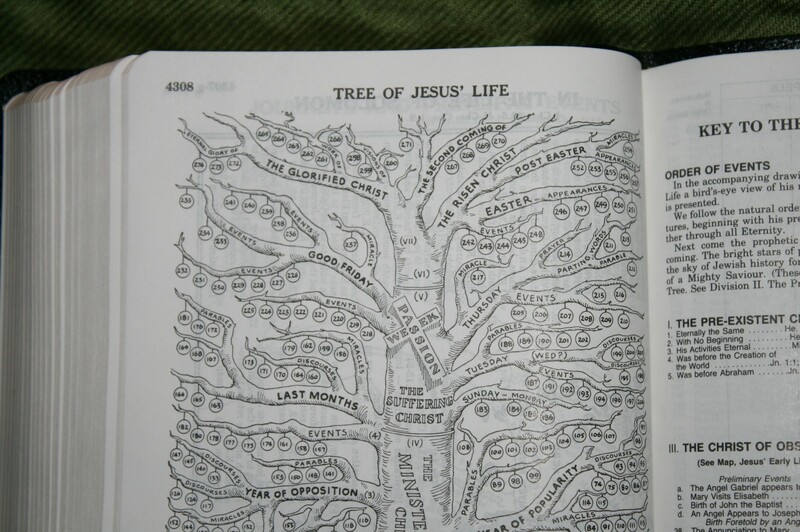 The margin includes topics, chain references, chains to topics, translator’s notes, note from the RV, dates, and topical headings. It also has chapter summaries. 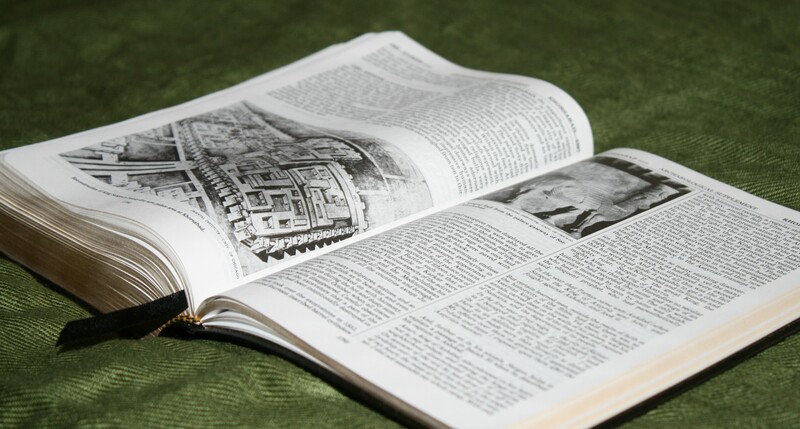 – The Concord has a glossary and a dictionary with information about people, places, concepts, etc. 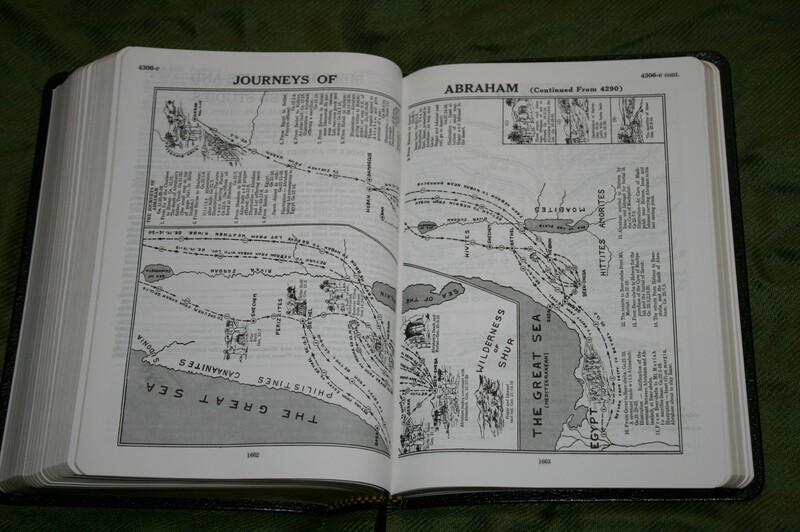 It also has a good concordance and maps. It has 80,000 cross references. It’s great for carry. The Concord is available in a personal size, regular size, and wide margin. The personal size is small and still readable. 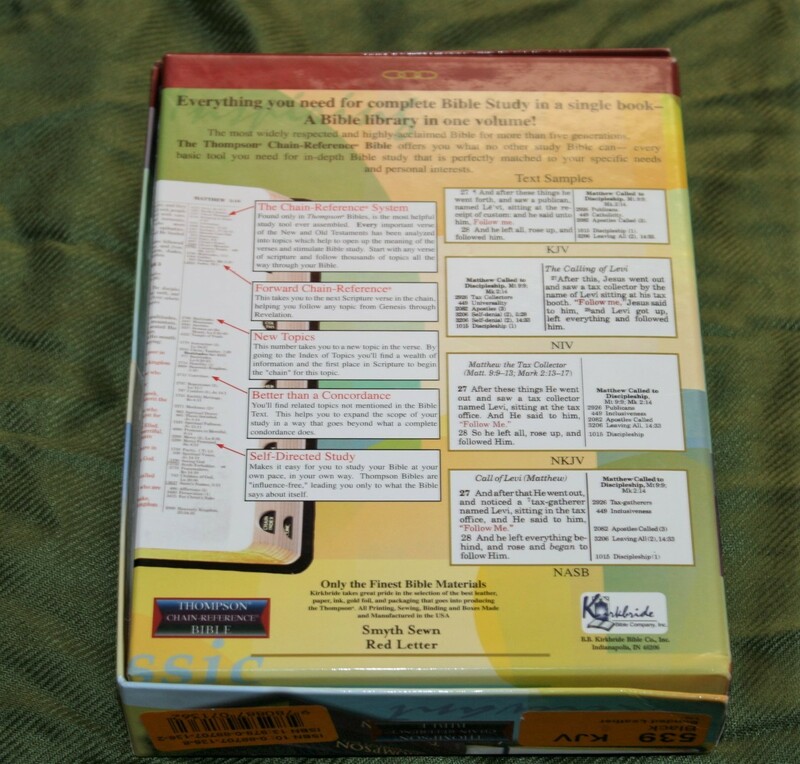 The personal size is smaller than the Thompson and includes the same info as the regular edition. There are no distractions within the text. 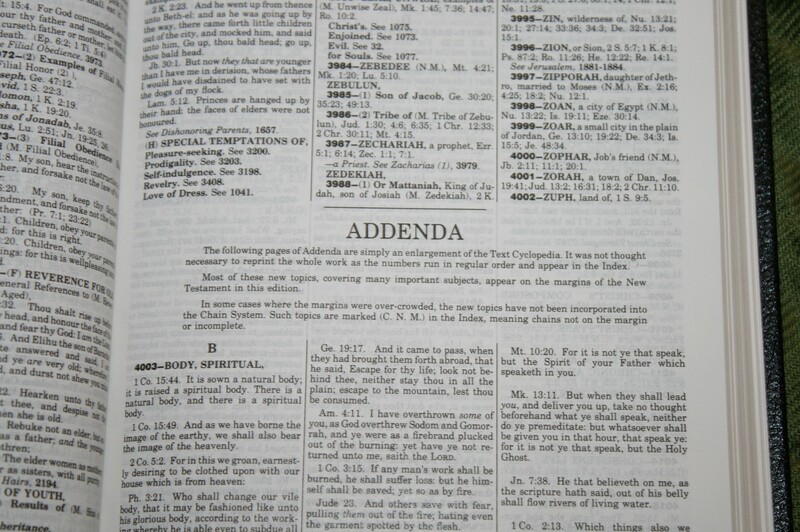 The center column includes references and translator’s notes. 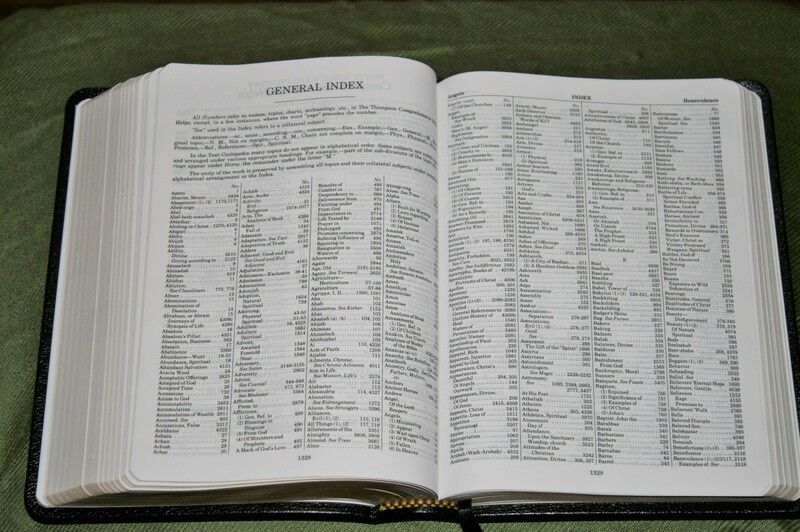 – The Westminster has a glossary in the margins, the same concordance as the Concord, and good maps. 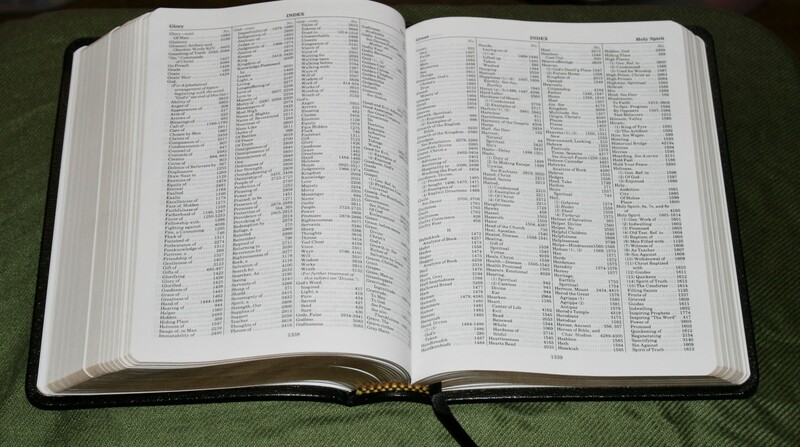 It has 200,000 cross references which include those in the Concord. 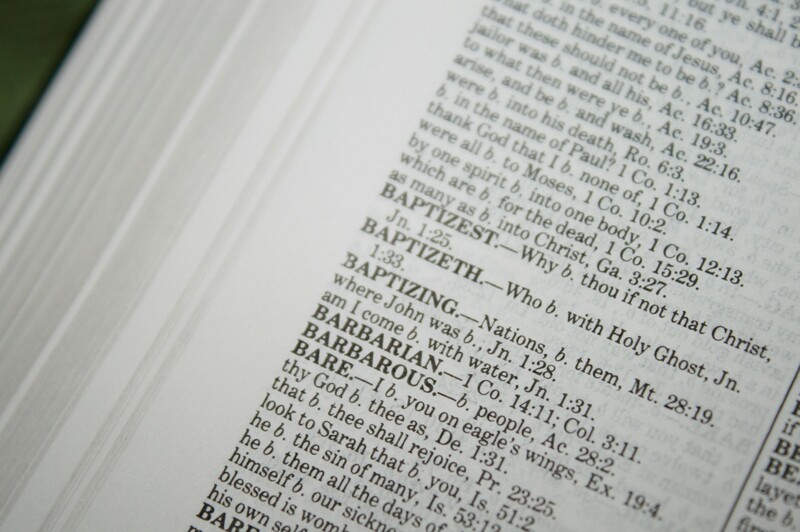 It doesn’t have a dictionary or topical lists, but its cross references are probably the best you’re going to find in a Bible. The Westminster is available in Compact and regular size. The regular size is similar to a regular Thompson. 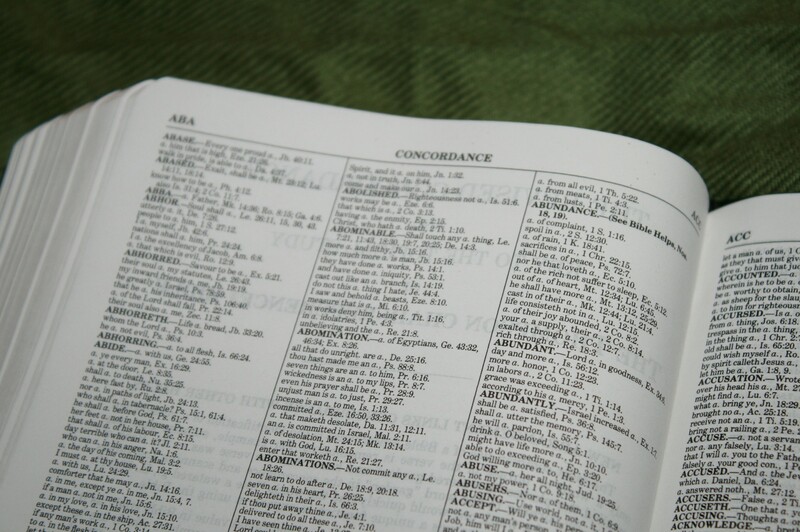 The Compact size is smaller than the hand size Thompson but doesn’t include a concordance. It does have reference and footnote keys in the text, but I don’t find them too distracting. 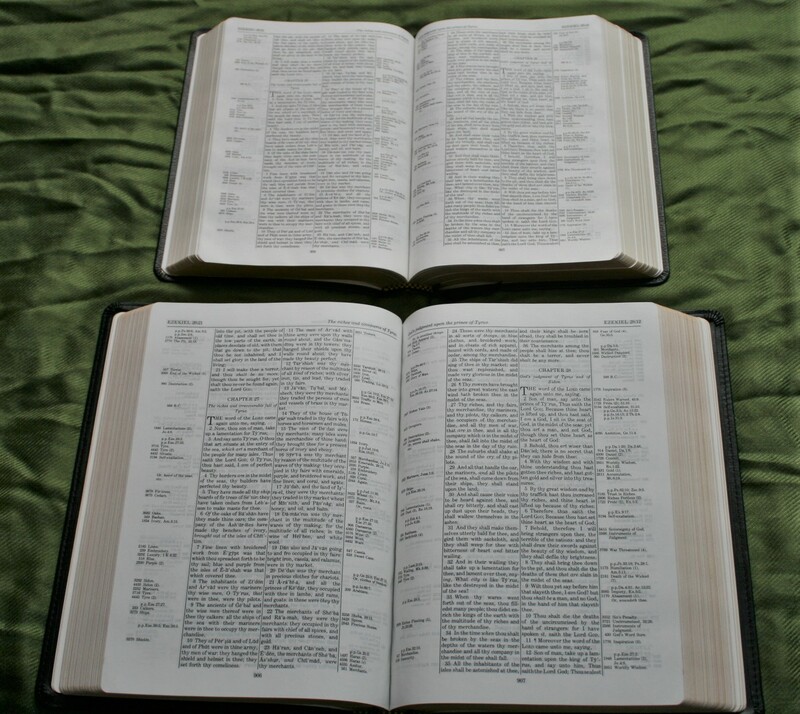 The margin’s have cross references, translator’s footnotes, updated words, and measures. It also has chapter summaries. 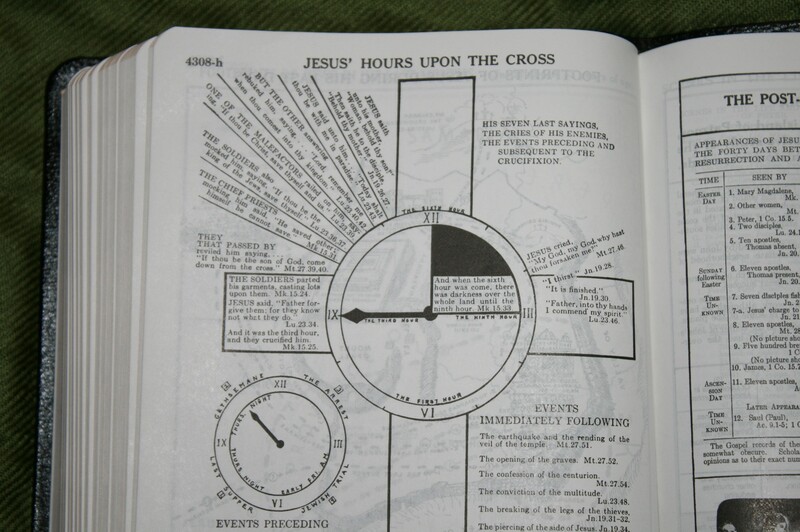 It’s main study material is the cross references. – both the Concord and Westminster are higher quality materials and construction than the Thompson. The Concord’s print is the darkest and is available in red or black letter. The Westminster is black only, and the Thompson is red only. Both have nice paper. The Thompson’s paper sometimes has a glare but it’s not that bad. 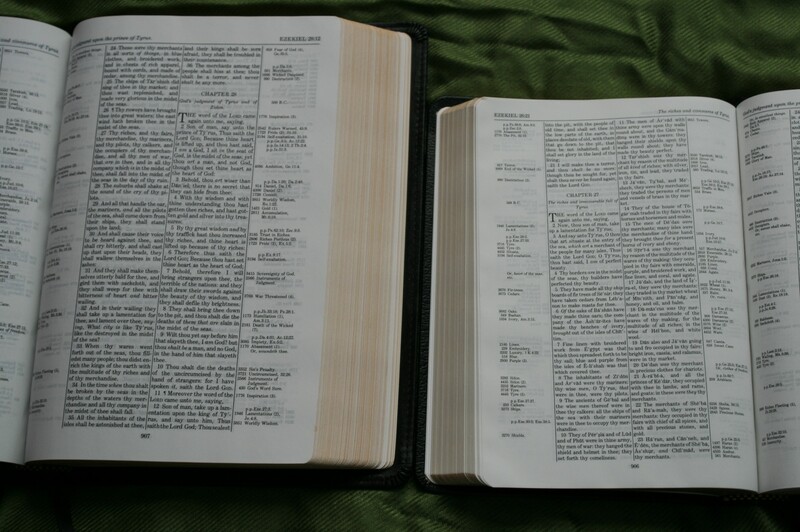 Randy, Just got my ESV Thompson and noticed the same thing about the spine curling inward. 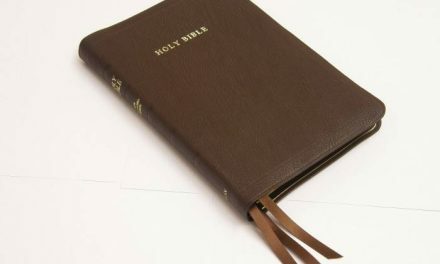 There seems to be excess leather on the spine? Do you think this is hard on the binding over time? Hi Brandon. I’ve seen this on several Thompson’s over the years and I’ve never had any issues other than bonded leather wearing out as expected. My genuine leather editions are still in good shape.